1-Joseph Briggs was born in 1747 in Barkisland, Halifax, Yorkshire, England, was christened on 31 Dec 1748 in Elland, Yorkshire, England, and died on 1 Apr 1829 in Ripponden, Yorkshire at age 82. Joseph married Grace Firth on 15 Feb 1779 in St Mary the Virgin Church of England, Elland, Yorkshire, England. They had seven children: John, Joseph, Elizabeth, Isaac, Hannah, Susan and Benjamin. 2-John Briggs was christened on 25 Feb 1781. 2-Joseph Briggs was christened on 1 Feb 1784. 2-Elizabeth Briggs was christened on 22 Oct 1786 in Ripponden, Yorkshire. Another name for Elizabeth was Betsy. 2-Isaac Briggs was born in Elland, Yorkshire, England, was christened on 25 Oct 1789 in Ripponden, Yorkshire, and died on 31 Oct 1852 in Black Brush, Brighton, Tasmania at age 63. Isaac married Alice Dean, daughter of Moses Dean and Mary Stansfield, on 27 Oct 1821 in St John the Baptist Church, Halifax, Yorkshire, England. Alice was born in 1797, was christened on 29 Nov 1797 in St Bartholomew's Church, Ripponden, Yorkshire, died on 1 Aug 1839 at sea off The Bay of Fires, North East Tasmania at age 42, and was buried at sea off The Bay of Fires, North East Tasmania. They had three children: Mary, Alice and Sarah Elizabeth. 3-Mary Briggs was christened on 25 Aug 1822 and probably died before 1838. 3-Alice Briggs was christened on 27 Feb 1825 in St. Bartholomew's, Ripponden, Yorkshire and died on 21 Aug 1849 in Sowerby, Yorkshire at age 24. Alice married John Stott on 22 Feb 1845 in St Johns Church, Halifax. John died after 1901. They had two children: Abraham and Sarah Ann. 4-Abraham Stott was born on 6 Feb 1847 in Sowerby, Yorkshire, England and died on 31 Dec 1922 at age 75. Abraham married Mary Ann Ramsden in 1868. Mary was born in 1849 and died in the fourth quarter of 1869 at age 20. They had a daughter: Mary Ann. 5-Mary Ann Stott was born in the fourth quarter of 1869. Abraham next married Hannah Maria Mellor, daughter of John Mellor, on 8 Feb 1879 in Trinity Road Baptist Chapel, Halifax, Yorkshire. Hannah was born in 1853 in Stainland, Yorkshire. They had two children: Walter and John Eli. 5-Walter Stott was born in 1881 in Elland, Yorkshire, England. Walter married Violet Hilda Akroyd in 1909 in Halifax, Yorkshire, England. Violet died in 1961. They had two children: Hilda and Frank Eric. 6-Hilda Stott was born in 1910 in Huddersfield, Yorkshire, England. 6-Frank Eric Stott was born on 10 Oct 1916 in Huddersfield, Yorkshire, England and was buried in 1979 in Huddersfield, Yorkshire, England. Frank married Vera Rhodes in 1941 in Huddersfield, Yorkshire, England. Vera was born about 1920 and died on 20 Jun 2013 aged about 93. They had two children: Jacqueline and Lynda. STOTT VERA On June 20th, 2013. Peacefully passed away, Vera aged 93 years of Fartown. Dearest wife of the late Eric. Treasured and much loved mum of Jackie and Lynda, mum-in-law of John and Chris, dearly loved sister of Ken and Audrey, also sister-in-law to Joyce, cherished nan and great-nanna. Will be sadly missed. The Service will take place at Fartown Trinity Church on Monday, July 1st at 1.00 p.m., followed by Committal at Park Wood Crematorium, Elland Wood Bottom. Family flowers only please, donations in lieu if so desired to Action for Children for which a plate will be provided at the Church. Will friends please accept this the only intimation and meet at the Church. Any enquiries to Highfield Funeral Service. Tel: 01484 428243. 7-Jacqueline Stott was born in 1944 in Huddersfield, Yorkshire, England. She possibly married John E. Moutell in 1966 and was married and living according to the 2012-2015 electoral Rolls for Holmfirth, Yorkshire. 7-Lynda Stott was born in 1948 in Huddersfield, Yorkshire, England. Lynda married Christopher J. Wright in 1968 in Huddersfield, Yorkshire, England. 5-John Eli Stott was born on 16 Jan 1884 in Stainland, Yorkshire, England and died in 1978 in Huddersfield, Yorkshire, England at age 94. He served in the First World War. 4-Sarah Ann Stott was born about Feb 1849 in Sowerby, Yorkshire and was buried on 24 Aug 1849 in Sowerby Chapel, Yorkshire, England. 3-Sarah Elizabeth Briggs was born on 28 Jul 1828 in Norland, Halifax, Yorkshire, England, was christened on 15 Nov 1831, and died on 30 Aug 1874 in Barrington, Tasmania at age 46. Sarah married John Cocker, son of John Cocker and Margaret Norman, on 22 Aug 1845 in Green Ponds, now Kempton, Tasmania. John was born in Sep 1812 in Cambridgeshire (now Norfolk) England, was christened on 16 Aug 1813 in Cambridgeshire (now Norfolk) England, died on 10 Feb 1872 in Evandale, Tasmania at age 59, and was buried in Uniting Church Cemetery, Evandale, Tasmania. They had 11 children: John, Sarah, Joseph, Louisa, Margaret Alice, William Alfred, George Samuel, Albert, James, Charles Robert Arthur and Jane Evangeline. 2-Hannah Briggs was christened on 30 Dec 1792 in Ripponden, Yorkshire. 2-Susan Briggs was christened on 5 Apr 1795 in Ripponden, Yorkshire. 2-Benjamin Briggs was christened on 4 Jun 1797 in Ripponden, Yorkshire and died on 28 Jul 1846 in Brighton, Tasmania at age 49. Benjamin married Lydey Lee on 18 Jul 1830 in Huddersfield, Yorkshire, England. Lydey was born in 1806 in England, died on 9 Nov 1842 in Brighton, Tasmania at age 36, and was buried on 9 Nov 1842 in Bagdad Congregational Cemetery. They had seven children: Joseph, Hannah, Jonathon Lee, Elizabeth, Sarah, Mary Ann and Lydia Sarah. 3-Joseph Briggs was born in 1827 in England, died on 17 May 1908 in Herdsman's Cove, Tasmania at age 81, and was buried on 19 May 1908 in St Marks, Pontville. Joseph married Louisa Mary Nichols, daughter of Henry Nichols and Rachel Marquand, on 24 Feb 1859 at Louisa Nichol's home, Dromedary, Brighton, Tasmania. Louisa was born about 1840 in England, died on 2 Aug 1932 in Herdsman's Cove, Tasmania aged about 92, and was buried in St Marks Anglican Church, Pontville. Henry Nichols, aged 44, his wife Rachel aged 38 and their 3 children Louisa aged 8, Henry aged 6 and Charles William aged 2 arrived in Hobart Town from London on the Eliza 15 Apr 1850. The ship carried 72 enrolled pensioners, including Henry and sixty male prisoners. Henry joined the police force and on the 19 Apr 1851 their fourth child Rachel was born. Later that year the family moved to Victoria as Henry was part of a company of enrolled pensioners to serve at the goldfields of Castlemaine. They returned to Van Diemen’s Land in 1853 where Henry was granted 6 acres of land at Dromedary. Joseph and Louisa had 11 children: Louisa Mary, Samuel, Edwin Joseph, Charles William, Elizabeth Rachel, Henry, Alfred, Arthur, Walter, Martha and Emily Maud. 4-Louisa Mary Briggs was born on 28 Apr 1860 in Brighton, Tasmania and died in 1938 in Pontville, Tasmania at age 78. Louisa married George Hanslow, son of George Hanslow and Thirza Cleverly, on 30 Apr 1885 in St Marks Anglican Church, Pontville. George was born on 14 Oct 1859 in Clarence, Tasmania. They had one son: George Albert. 5-George Albert Hanslow was born on 27 Feb 1887 in Brighton, Tasmania. 4-Samuel Briggs was born on 9 Apr 1862 in Brighton, Tasmania and died on 22 May 1936 in Bagdad, Tasmania at age 74. Samuel married Rebecca Harding, daughter of Robert Harding and Mary Kirkwood, on 1 Jan 1891 in Brighton, Tasmania. Rebecca was born in 1854 in Brighton, Tasmania. 4-Edwin Joseph Briggs was born on 29 May 1864 in Brighton, Tasmania. 4-Charles William Briggs was born on 19 Jan 1866 in Brighton, Tasmania, died on 21 Jan 1945 in Pontville, Tasmania at age 79, and was buried on 23 Dec 1945 in St Marks Anglican Church, Pontville. Charles married Thurza Hanslow, daughter of George Hanslow and Thirza Cleverly, on 26 Jan 1887 in St Mary's Church of England, Bridgewater, Tasmania. Thurza was born on 22 Aug 1861 and died on 7 Sep 1950 at age 89. They had nine children: Charles Joseph, George Percy, Beatrice Lavinia, Amy Thurza Louisa, Thomas William, Edwin Leslie, Henry Bertie, John David and Douglas Walter. 5-Charles Joseph Briggs† was born on 15 Jan 1888 in Brighton, Tasmania and died on 22 Aug 1916 in France at age 28. Charles married Ethel Belbin. BRIGGS. - Killed in action in France on or about the 22nd August, Private Charles Joseph, of the 12th Battalion, the dearly beloved husband of Ethel Briggs, and eldest son of Charles and Thurza Briggs, of Brighton Junction in his 29th year. He gave his life for King and Country. 5-George Percy Briggs was born on 4 Feb 1889 in Brighton, Tasmania. 5-Beatrice Lavinia Briggs was born on 10 Oct 1890 in Brighton, Tasmania. Beatrice married Albert Ernest Reeve on 13 Mar 1912 in St Marks Anglican Church, Pontville. 5-Amy Thurza Louisa Briggs was born on 9 Oct 1892 in Brighton, Tasmania. Amy married Bernard Victor Creed on 5 Sep 1917 in St Marks Anglican Church, Pontville. 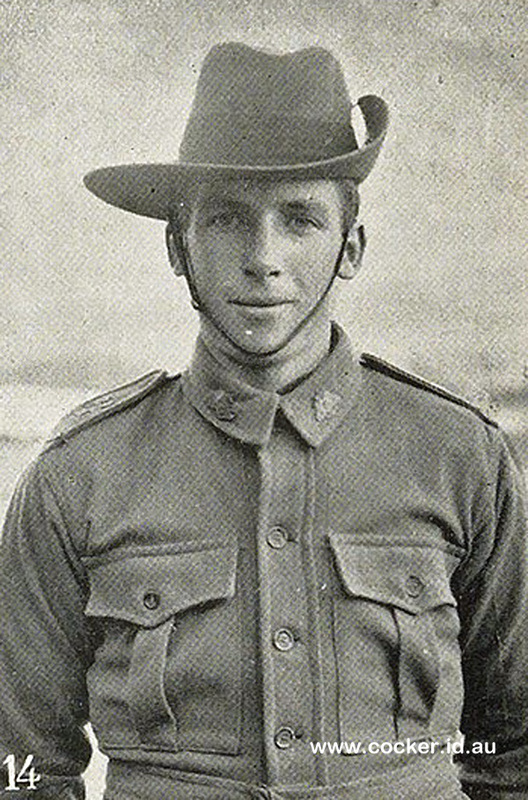 5-Thomas William Briggs was born on 3 Jun 1894 in Brighton, Tasmania and died on 2 Jun 1954. 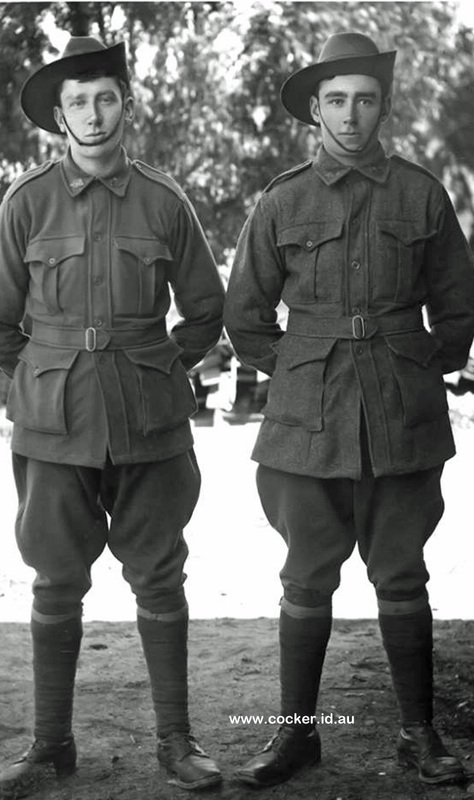 He served in the First World War in the 12th Battalion, 23rd Reinforcement . Thomas married Ethel Belbin. 5-Edwin Leslie Briggs† was born on 6 Apr 1896 in Brighton, Tasmania, died on 28 Mar 1918 in Somme sector, France at age 21, and was buried in Heilly Station Cemetery (Plot VII, Row A, Grave No. 48), Mericourt-L'Abbe, France. 5-Henry Bertie Briggs† was born on 27 Jul 1898 in Brighton, Tasmania and died on 8 May 1918 in Moquet Farm, France at age 19. Mr. and Mrs. C. Briggs, of Brighton Junction, have just been officially notified that their son, Private Bertie Briggs, died of wounds on May 8. This makes the third son to make the supreme sacrifice. He was 19 years of age. Private Joseph Briggs' was killed at Mouquet Farm in August, 1916, and Private Leslie Briggs on March 28 last. Another son, Will, is still on active service. 5-John David Briggs was born on 9 Sep 1902 in Brighton, Tasmania and died on 5 Apr 1972 at age 69. 5-Douglas Walter Briggs was born on 12 Apr 1906 in Brighton, Tasmania. 4-Elizabeth Rachel Briggs was born on 30 Mar 1869 in Brighton, Tasmania. 4-Henry Briggs was born on 22 Aug 1871 in Brighton, Tasmania, died on 20 Aug 1919 in Tea Tree, Tasmania at age 47, and was buried on 22 Aug 1919 in St Marks Anglican Church, Pontville. Henry married Caroline. 4-Alfred Briggs was born on 23 Sep 1873 in Brighton, Tasmania. 4-Arthur Briggs was born on 11 Aug 1875 in Brighton, Tasmania. 4-Walter Briggs was born on 7 Feb 1878 in Brighton, Tasmania, died on 6 Aug 1944 in Bridgewater, Tasmania at age 66, and was buried on 8 Aug 1944 in St Mary's Church of England, Bridgewater, Tasmania. Walter married Hilda Campbell Cox, daughter of James Cox and Emily Sophia Smith, on 4 Sep 1918 in Hobart. Hilda was born on 20 Sep 1882 in Brighton, Tasmania and died on 5 Oct 1939 in Royal Hobart Hospital at age 57. 4-Martha Briggs was born on 10 Aug 1880 in Brighton, Tasmania. 4-Emily Maud Briggs was born on 18 Dec 1882 in Brighton, Tasmania. 3-Hannah Briggs was born on 21 Mar 1831 in Ripponden, Yorkshire and died in 1839 in Halifax, Yorkshire, England at age 8. 3-Jonathon Lee Briggs was born on 1 Feb 1833 in Ripponden, Halifax, Yorkshire, England, was christened on 9 Jun 1833 in Ripponden, Halifax, Yorkshire, England, died on 27 Feb 1834 in Ripponden, Halifax, Yorkshire, England at age 1, and was buried in 1834 in Rippendon Chapel, Halifax, Yorkshire, England. 3-Elizabeth Briggs was born in 1835 in Halifax, Yorkshire, England, was christened on 18 Oct 1835 in Halifax, Yorkshire, England, and died on 2 Jan 1902 in Benevolent Asylum, Launceston at age 67. Elizabeth married Thomas Hampton on 14 Oct 1850 in St Marks, Pontville. Thomas was born in 1819 in England, was murdered on 24 Nov 1859 in Tasmania at age 40, and was buried in St Marks Anglican Church, Pontville. They had two children: Ann and Sarah Lydia. Good and lawful men of the said Island and duly chosen and who being then and there duly sworn and charged to enquire for our said Lady the Queen when where how and after what manner the said Thomas Hampton came to his death do upon their Oath say THAT a certain person or persons to the Jurors aforesaid unknown, on the Twenty Fourth day of November in the year aforesaid, one Thomas Hampton feloniously wilfully and of malice aforethought, did kill and murder against the peace of our Lady the Queen her crown and dignity. In Witness whereof as well the said Coroner as the Jurors aforesaid have to this Inquisition set their Hands and Seals the day and year and place above mentioned. 4-Ann Hampton was born on 3 Dec 1851 in Brighton, Tasmania and died on 21 Dec 1919 in Zeehan, Tasmania at age 68. LAW SUPREME COURT.-SITTINGS IN BANCO. Before Sir Valentino Fleming, Knt., Chief Justice, and Sir Francis Smith, Knt., Pusine Judge. In re Ann Hampton (an infant). an infant 12 years of age. The father of the infant, Thomas Hampton, died intestate on the 24th November 1859, leaving personal estate of the value of .£1,110 14s. 2d., and real estate of the value of £75; which were now in the hands of the Curator of Intestate Estates. The application had previously been made in chambers, and was then adjourned in consequence of its being opposed by the mother of the infant, who desired to be ap- pointed guardian herself. He (the learned counsel) now produced an affidavit of consent on the part of the mother. He had further to apply that a sufficient sum for the maintenance of the infant be made payable from the funds above mentioned. The object of the application was that the infant should be placed in a respectable boarding school and the sum proposed to be allowed for this purpose was £80 per annum. Their Honors expressed a belief that half the probable income of the infant viz £70 per year would suffice for her maintenance. They assented to the vesting of the guardianship in Mr. Finlay subject to an amendment of the affidavit of consent and also to the payment of £70 a-year for maintenance from the date of the order. Anne left Brighton and lived at Westbury and worked on the ‘Egmont' property owned by the Greenhill family where she had a relationship with John Jones. They had two children: Minnie Maria and Thomas Henry. 5-Minnie Maria Jones was born on 7 May 1874 in Launceston, Tasmania and died on 6 Sep 1940 at age 66. Minnie married blacksmith Robert Matthew Goninon on 23 Jan 1892 in George Town, Tasmania. Robert was born about 1871. They had ten children: Robert Mathew Luther, Baby, Wesley, John Thomas, Richard, Henry Federal, Harley James Raymond, Lena Mary, Joyce Annie and Cecil Gordon. 6-Robert Mathew Luther Goninon was born on 20 May 1892 in Beaconsfield, Tasmania. Robert married Annie Dinah Williams on 6 Apr 1914 in Railton, Tasmania. They had three children: Richard Jellico, Jean May and Claude Douglas. 7-Richard Jellico Goninon was born on 27 Nov 1914 in Burnie, Tasmania. 7-Jean May Goninon was born on 12 May 1916 in 12 Williamson Street, North Hobart. 7-Claude Douglas Goninon was born on 3 Sep 1918 in 17 Windsor Street, Inveresk, Launceston. 6-Baby Goninon was born on 13 Nov 1893 in Strahan and died on 15 Nov 1893. 6-Wesley Goninon was born on 24 Jan 1895 in Zeehan, Tasmania. 6-John Thomas Goninon was born on 2 Jun 1898 in Beaconsfield, Tasmania. 6-Richard Goninon was born on 25 Dec 1904 in Burnie, Tasmania. 6-Henry Federal Goninon was born on 10 Oct 1909 in Burnie Baptist Church. 6-Harley James Raymond Goninon was born on 17 Nov 1911 in Burnie, Tasmania. 6-Lena Mary Goninon was born on 18 Nov 1913 in Burnie, Tasmania. 6-Joyce Annie Goninon was born on 10 May 1915 in Burnie, Tasmania. 6-Cecil Gordon Goninon was born on 10 Aug 1917 in Montello, Burnie, Tasmania. 5-Thomas Henry Jones was born on 17 Apr 1875 in Westbury, Tasmania. Thomas married, using the name Hampton, Lily May Smith, daughter of William Henry Smith and Maria Lavinia, on 7 Jul 1896 in Beaconsfield, Tasmania. Lily was born about 1879. They had five children: William Henry, Raymond Clyde, Stella Isabella, Iris Thelma Nise and Harry George. 6-William Henry Hampton was born on 3 Dec 1896 in Beaconsfield, Tasmania and died in 1971 in New Norfolk, Tasmania at age 75. William married Linda May Laycock on 4 Aug 1917 in St Pauls Church, East Devonport. Linda was born about 1896 in Devonport. They had two children: Betty Icebell and Tessie Pearle. 7-Betty Icebell Hampton was born on 7 Nov 1917 in Roseberry, Tasmania. 7-Tessie Pearle Hampton was born on 28 Jun 1919 in Roseberry. Tessie married Cyril John Cole. Cyril was born on 14 Sep 1903 in Deloraine, Tasmania and died in 1972 in Launceston, Tasmania at age 69. 6-Raymond Clyde Hampton was born on 3 Jan 1899 in Beaconsfield, Tasmania. Raymond married Violet Isabel Garrett, daughter of Charles David Garrett and Mary Magdeline OBrien, on 19 Apr 1927 in Zeehan, Tasmania. Violet was born on 3 Jun 1906 in Zeehan, Tasmania. 6-Stella Isabella Hampton was born on 25 Jul 1901 in Beaconsfield, Tasmania. Stella married Allan Wills Hayward on 24 Aug 1921 in St Georges Church, Roseberry. 6-Iris Thelma Nise Hampton was born on 2 Oct 1902 in Beaconsfield, Tasmania. 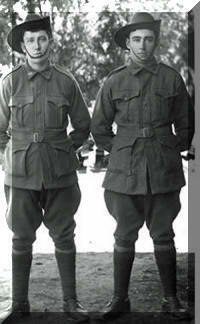 6-Harry George Hampton was born on 26 Jan 1913 in Roseberry, Tasmania. Ann moved to Beaconsfield where her sister Sarah and her husband George Page lived. The two children were raised with their Aunt, Sarah Page. They kept their mother's maiden surname, Hampton. Ann remained in Beaconsfield after daughter Minnie married and assisted with the grand children as the family grew. She then married miner Richard Bones (Bone), son of convict ↑James Bones and Mary Ann Cowen (daughter of convicts ↑Thomas Cowen and ↑Mary Walker Blease/|Bleeze), on 20 Dec 1892 in the Brides home, Beaconsfield, Tasmania. Richard was born in Port Cygnet on 16 Dec 1859. They moved to Zeehan where Richard died on 2 Feb 1904 and she died in 1919. Ann and Richard had no children. 4-Sarah Lydia Hampton was born on 22 Oct 1860 in Brighton, Tasmania and died on 26 Jun 1944 in Tasmania at age 83. Sarah married her first cousin George Henry Page, son of George Page and Mary Ann Briggs, on 26 Jan 1882 in Independent Church, Tamar St Launceston. George was born on 25 Dec 1859 in Launceston, Tasmania, died on 27 Jul 1903 in Beaconsfield, Tasmania at age 43, and was buried in Beaconsfield General Cemetery. They had three children: George Herbert, Ernest Henry and Ethel Isabel. 5-George Herbert Page was born on 8 Sep 1882 in Beaconsfield, Tasmania and died on 11 Sep 1882 in Beaconsfield, Tasmania. 5-Ernest Henry Page was born on 23 Jan 1884 in Beaconsfield, Tasmania and died in 1931 in North Sydney, New South Wales at age 47. Ernest married Ada Lillian Hutton, daughter of John William Hutton and Elizabeth Ann Herron, on 12 Dec 1906 in Swan Street, Hobart. Ada was born on 18 Nov 1884 in Deloraine, Tasmania and died in 1964 in St Leonards, New South Wales at age 80. They had four children: Ethel May, Ernest, Eric Melville and Kenneth Robert. 6-Ethel May Page was born on 17 Sep 1907 in Beaconsfield, Tasmania and died in 1994 in Castle Hill, New South Wales at age 87. Ethel married William Daniel Tomlinson in 1926 in New South Wales. William was born on 10 Mar 1904 in South Australia and died on 9 Nov 1966 in Mona Vale, New South Wales at age 62. 6-Ernest Page was born on 10 Jun 1909 in Branxholm, Tasmania and died on 17 Aug 1966 in Sydney, New South Wales at age 57. Ernest married Thelma Edith May Carter on 8 Jun 1929 in New South Wales. Thelma was born on 8 Sep 1912 in New South Wales and died on 2 Jun 1961 in Ryde, News South Wales at age 48. 6-Eric Melville Page was born on 14 Oct 1910 in Gordon, Tasmania and died on 29 Jun 1969 in Sydney, New South Wales at age 58. Eric married Hazel Mirabel Walpole, daughter of John Thomas Walpole and Eva Victoria Miscamble, in 1935 in Manly, Sydney, New South Wales. Hazel was born on 8 Feb 1914 and died on 19 Dec 2013 at age 99. They had one son: Bryan Melville. 7-Bryan Melville Page. Bryan married Janice. 6-Kenneth Robert Page was born on 11 Dec 1912 in Dover, Tasmania and died on 8 Jul 1965 in Rockdale, New South Wales at age 52. Kenneth married Myra Emily Hawkins in 1939 in New South Wales. Myra was born in 1913 and died on 27 May 1992 in New South Wales at age 79. 5-Ethel Isabel Page was born on 3 Sep 1886 in Beaconsfield, Tasmania and died in 1957 in Manly, Sydney, New South Wales at age 71. Elizabeth next married farmer Charles Jones on 21 Jul 1863 in Kensington Chapel, O'Briens Bridge, Hobart. Charles was born about 1829. They had three children: Emily Mary, Charles William and Roland Edward. 4-Emily Mary Jones was born on 13 Dec 1864 in Hobart Town, Van Diemen's Land. Emily married tradesman George Rowland Stewart, son of William Stewart and Eliza Miles, on 29 Sep 1886 in St Georges Anglican Church, Battery Point. George was born on 30 Dec 1866 in Hobart. They had four children: Emily Hilda, Edward Roland, Cecil William and Vera May. 5-Emily Hilda Stewart was born on 6 Jul 1890 in Ringarooma, Tasmania. 5-Edward Roland Stewart was born on 26 Jun 1892 in Ringarooma, Tasmania. 5-Cecil William Stewart was born on 13 Jul 1894 in Ringarooma, Tasmania. 5-Vera May Stewart was born on 22 Sep 1899 in Beaconsfield, Tasmania. Vera married Herbert Claude Collins, son of Edward Collins and Harriet De Graaff. Herbert was born in 1900 and died in 1957 at age 57. They had one daughter: Janice. 4-Charles William Jones was born on 31 May 1867 in Hobart, Tasmania and died on 8 Aug 1869 in Hobart, Tasmania at age 2. 4-Roland Edward Jones was born on 6 Jun 1869 in Hobart, Tasmania. Roland married Ellen Alexandra McRae on 29 Jan 1896 in Beaconsfield, Tasmania. They had ten children: Francis Edward, Charles Roland, Muriel Madge, Alexandria Grace, Tasman George, Ethel Florence, Nellie Ballanie, Roland Kenneth, Jack Allan and Maxwell Ross. 5-Francis Edward Jones was born on 25 Aug 1896 in Beaconsfield, Tasmania. 5-Charles Roland Jones was born on 20 Aug 1898 in Beaconsfield, Tasmania. 5-Muriel Madge Jones was born on 20 Aug 1900 in Beaconsfield, Tasmania. 5-Alexandria Grace Jones was born on 8 Sep 1904 in Beaconsfield, Tasmania. 5-Tasman George Jones was born on 24 Aug 1906 in Beaconsfield, Tasmania. 5-Ethel Florence Jones was born on 21 Oct 1908 in Beaconsfield, Tasmania. 5-Nellie Ballanie Jones was born on 19 Nov 1909 in Beaconsfield, Tasmania. 5-Roland Kenneth Jones was born on 31 Jan 1912 in Beaconsfield, Tasmania. 5-Jack Allan Jones was born on 25 May 1913 in Beaconsfield, Tasmania. 5-Maxwell Ross Jones was born on 21 Jun 1915 in Beaconsfield, Tasmania. 3-Sarah Briggs was born about 1835 in England and died on 28 Jan 1903 in Hobart, Tasmania aged about 68. Sarah married convict ↑Joseph Bedford, son of William Bedford and Phoebe Marshall, on 9 Jan 1855 in House of John Hayes, Bagdad. Joseph was born on 22 Jan 1821 in Yardley, Northamptonshire, England and died on 22 Oct 1906 in Hobart, Tasmania at age 85. They had seven children: Mary, Elizabeth Ann, Phoebe Amy, William Joseph, Arthur, Edith Mary and Frances Ida. 4-Elizabeth Ann Bedford was born on 14 Jun 1860 in Brighton, Tasmania. 4-Phoebe Amy Bedford was born on 22 Feb 1863 in Brighton, Tasmania and died in 1942 in Rozelle, New South Wales at age 79. Phoebe married John Wolstenholme about 1887. John was born about 1849 and died about 1924 aged about 75. 4-William Joseph Bedford was born on 8 Oct 1865 in Brighton, Tasmania, was christened on 19 Nov 1865 in St Marks, Pontville, and died on 1 Sep 1949 in Royal Hobart Hospital at age 83. William married Mary Thelma Eliza Jackson, daughter of William Isaac Jackson and Jacobina Elizabeth Pearce, on 24 Apr 1886 in St Marks Anglican Church, Pontville. Mary was born on 23 Dec 1865 in Brighton, Tasmania and died on 3 May 1898 in Brighton, Tasmania at age 32. They had six children: Ruby Isola, Vera Warburton, William Robert Hepburn, Leslie Vivian, Clarice Robina and Clarence Reginald. 5-Ruby Isola Bedford was born on 24 Jan 1887 in Brighton, Tasmania, died on 9 May 1950 in the Launceston General Hospital at age 63, and was buried in May 1950 in Carr Villa Cemetery, Launceston, Tasmania. Ruby married Cyril John Reid, son of Francis James Reid and Rachel Isabell Badcock, in 1909 in Tasmania. Cyril was born on 9 Sep 1882 in Westbury, Tasmania, died on 15 Feb 1921 at age 38, and was buried on 18 Feb 1921 in Carr Villa, Launceston. They had five children: Laurence Bedford, Clarice Isobel, Nancy Margaret, Reginald Francis and Kathleen Thelma. 6-Laurence Bedford Reid was born on 22 Apr 1911 and died on 4 Jul 1988 at age 77. Laurence married Jean Maria O'Donnell. Jean was born in 1909 and died in 1971 at age 62. They had four children: Michael Francis, John Hepburn, Geraldine and David. 7-Michael Francis Reid was born in 1939. 7-John Hepburn Reid was born in 1939. 6-Clarice Isobel Reid was born on 26 Nov 1913 and died on 28 Apr 1989 at age 75. Clarice married Rhonsley Percival. Rhonsley was born on 25 Jan 1920 and died on 21 Jul 1975 at age 55. They had four children: Heather, Christine, Judith and Rhonda. 6-Nancy Margaret Reid was born on 30 Mar 1915 in Colebrook, Tasmania and died on 14 Jul 1988 in Sydney, New South Wales at age 73. Nancy married Ardley Leonard Crooks, son of James Alexander Leonard Crooks and Elsie Olive Pearl Tolson. Ardley was born on 16 Feb 1916 in Trevallyn, Tasmania and died on 15 Sep 1999 in Sydney, New South Wales at age 83. They had five children: Ian, David, Robert, Alan and Andrew. 6-Reginald Francis Reid was born on 18 Nov 1917 in Bagdad, Tasmania and died on 25 Aug 1994 at age 76. Reginald married Miriam Lorraine Andrews, daughter of Tasman Cleaver Andrews and Pearl Kathleen Frances Goodyer. Miriam was born on 10 Feb 1925 and died on 11 Nov 1968 at age 43. They had four children: Karen Isola, Deborah, Michelle and Mark. 7-Karen Isola Reid was born on 3 Jun 1957. 6-Kathleen Thelma Reid was born on 5 Jan 1920. Kathleen married Harold John Jones, son of Harold Percival Jones and Ann Crump Partington. Harold was born on 15 Feb 1921. They had five children: Christopher, Lynne, Robert, Richard and John. 5-Vera Warburton Bedford was born on 25 May 1888 in Brighton, Tasmania. 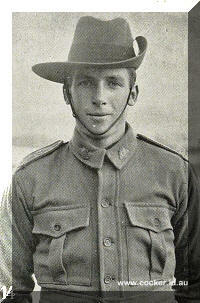 5-William Robert Hepburn Bedford was born on 26 Oct 1889 in Brighton, Tasmania. 5-Leslie Vivian Bedford was born on 2 Dec 1891 in Brighton Beach, Victoria. 5-Clarice Robina Bedford was born on 2 Sep 1893 in Brighton, Tasmania. 5-Clarence Reginald Bedford was born on 29 Nov 1895 in Brighton, Tasmania. 4-Arthur Bedford was born on 3 Oct 1868 in Brighton, Tasmania. 4-Edith Mary Bedford was born on 11 Dec 1870 in Brighton, Tasmania and died on 16 Apr 1948 at age 77. Edith married George Marks, son of George Marks and Mary Kelly. George was born on 13 Feb 1862 in Hobart, Tasmania and died on 18 Apr 1947 at age 85. They had one son: Allan Bedford. 5-Allan Bedford Marks was born on 11 Jan 1904 and died on 27 Oct 1979 at age 75. Allan married Zena Rosa Avery. Zena was born on 31 May 1910. They had one son: Roger Roy. 6-Roger Roy Marks was born on 22 Jun 1936. Roger married Ann Jennifer Wornham. 4-Frances Ida Bedford was born on 12 May 1874 in Brighton, Tasmania and died on 31 Dec 1949 at age 75. Frances married John Charles Meredith in 1902 in Sydney, New South Wales. John was born about 1880 in Scone, NSW. 3-Mary Ann Briggs was born in 1837 in Halifax, Yorkshire, England, was christened on 5 Mar 1837 in Halifax, Yorkshire, England, died on 13 Nov 1926 in Lawrence St, Launceston, Tasmania at age 89, and was buried on 15 Nov 1926 in Carr Villa, Launceston. Mary married convict ↑George Page on 21 Mar 1853 in St Marks Anglican Church, Pontville. George was born about 1827 in Lewes, Sussex, England and died on 25 Jul 1888 in Beaconsfield, Tasmania aged about 61. They had nine children: Sarah Charlotte, Mary Ann, George Henry, Orman Emerlick, Emily Alice, Elizabeth Julia, Fanny Lydia, Anne Amelia and Thomas Benjamin. 4-Sarah Charlotte Page was born on 26 May 1854 in Brighton, Tasmania and died on 18 Jun 1922 in Launceston at age 68. Sarah married Edward Cumberland Joyce on 13 Jan 1880 in Launceston. Edward was born on 3 May 1849 in Launceston and died on 27 Dec 1912 in Trevallyn, Tasmania at age 63. They had two children: Edward George and Florence Maude. 5-Edward George Joyce was born on 16 Jul 1880 in Launceston, Tasmania and died on 24 Sep 1946 in Hobart, Tasmania at age 66. Edward married Caroline Henry in 1904 in Tasmania. Caroline was born on 27 Dec 1868 and died on 28 Oct 1943 in Bellerive, Tasmania at age 74. 5-Florence Maude Joyce was born on 20 Jan 1882 in Launceston, Tasmania and died on 2 Aug 1961 in Launceston, Tasmania at age 79. Florence married Ernest William Cartledge on 10 Apr 1907 in St Oswald's Church, Trevallyn, Tasmania. Ernest was born on 19 Jul 1881 in Launceston, Tasmania and died on 29 Jul 1961 in Launceston, Tasmania at age 80. 4-Mary Ann Page was born on 4 Jun 1857 in Brighton, Tasmania and died in 1924 in Melbourne, Victoria at age 67. Mary married Thomas Casey on 31 May 1880 in Launceston, Tasmania. 4-George Henry Page was born on 25 Dec 1859 in Launceston, Tasmania, died on 27 Jul 1903 in Beaconsfield, Tasmania at age 43, and was buried in Beaconsfield General Cemetery. George married Sarah Lydia Hampton, daughter of Thomas Hampton and Elizabeth Briggs, on 26 Jan 1882 in Independent Church, Tamar St Launceston. Sarah was born on 22 Oct 1860 in Brighton, Tasmania and died in Tasmania. They had three children: George Herbert, Ernest Henry and Ethel Isabel. 6-Eric Melville Page was born on 14 Oct 1910 in Gordon, Tasmania and died on 29 Jun 1969 in Sydney, New South Wales at age 58. Eric married Hazel Walpole. 4-Orman Emerlick Page was born on 11 Jul 1862 in Longford, Tasmania and died on 5 Jul 1863 in Longford, Tasmania. 4-Emily Alice Page was born on 17 Jun 1864 in Longford, Tasmania and died on 14 Jun 1938 at home, Lawrence Street, Launceston, Tasmania at age 73. Emily married Arthur Ernest Green, son of Frederick Green and Agnes Carr, on 19 Feb 1884 in Launceston, Tasmania. Arthur was born on 11 Sep 1861 in Launceston, Tasmania and died on 27 Aug 1939 in Launceston General Hospital, Launceston, Tasmania at age 77. They had four children: Arthur Ernest, Ernest George, Percy Brougham and Tasman William. 5-Arthur Ernest Green was born on 13 Jun 1885 in Launceston, Tasmania. 5-Ernest George Green was born on 10 Apr 1887 in Launceston, Tasmania. 5-Percy Brougham Green was born on 3 Apr 1888 in Launceston, Tasmania. 5-Tasman William Green was born on 1 Nov 1890 in Launceston, Tasmania. 4-Elizabeth Julia Page was born on 24 Jan 1867 in Longford, Tasmania and died on 5 Nov 1941 in Launceston at age 74. Elizabeth married Robert Herron, son of Robert Herron and Sarah Thompson. Robert was born on 14 Jan 1868 in Port Sorell and died on 14 Apr 1940 in the Launceston General Hospital at age 72. They had three children: Henry Thomas, Olive Isabel and Lillian Elvie. 5-Henry Thomas Herron was born on 7 Apr 1896 in Lefroy, Tasmania and died on 5 Dec 1949 in Launceston, Tasmania at age 53. Henry married Elizabeth Mary Powell. Elizabeth was born on 18 Dec 1894 in Launceston, Tasmania and died on 17 Apr 1970 in Launceston, Tasmania at age 75. 5-Olive Isabel Herron was born on 25 Mar 1898 in Lefroy, Tasmania and died on 31 Jan 1974 in Earlwood, New South Wales at age 75. Olive married John Edward Victor Lowe. John was born in 1893 in Fitzroy, Victoria and died in 1946 in Earlwood, New South Wales at age 53. 5-Lillian Elvie Herron was born on 23 Feb 1901 in Beaconsfield, Tasmania and died on 30 Sep 1957 in Launceston, Tasmania at age 56. 4-Fanny Lydia Page was born on 28 Jun 1869 in Longford, Tasmania. Fanny married Thomas Ernest Stonehouse, son of Alfred Stonehouse and Lydia Freeman, on 26 May 1897 in Lefroy, Tasmania. Thomas was born on 16 Apr 1870 in Launceston, Tasmania and died on 7 Jul 1940 in George Town, Tasmania at age 70. 4-Anne Amelia Page was born on 7 Aug 1872 in Westbury, Tasmania and died on 22 Feb 1941 in Sheffield, Tasmania at age 68. Anne married William Frederick Grundy on 15 Jan 1890 in Sheffield, Tasmania. William was born on 8 Nov 1865 in Port Sorell, Tasmania and died on 30 Apr 1945 in Sheffield, Tasmania at age 79. They had two children: William George and Francis Henry. 5-William George Grundy was born on 14 Dec 1893 in Sheffield, Tasmania. William married Elizabeth Susan Campbell on 30 Jun 1915 in Pateena, Tasmania. Elizabeth was born on 11 Mar 1889 in Longford, Tasmania. 5-Francis Henry Grundy was born on 4 Jul 1896 in Sheffield, Tasmania. Francis served in the First World War. 4-Thomas Benjamin Page was born on 8 Jun 1873 in Westbury, Tasmania and died on 14 Dec 1934 in Beaconsfield, Tasmania at age 61. Thomas married Emily Jane Neal, daughter of Charles and Sarah Neal, on 21 Oct 1896. Emily was born about 1876 in Mt. Gambier, South Australia. They had one daughter: Emily Beatrice. 5-Emily Beatrice Page was born in 1900 in Beaconsfield, Tasmania and died on 27 May 1988 in Brunswick, East Victoria at age 88. Emily married Stanley Gordon Price on 5 Jul 1920 in Launceston, Tasmania. Stanley was born on 13 Jul 1891 in Beaconsfield, Tasmania and died on 12 Sep 1964 in Brunswick, East Victoria at age 73. 3-Lydia Sarah Briggs was born in 1838 in Yorkshire, England and died on 13 Jan 1879 in Hobart, Tasmania at age 41. Lydia married convict ↑William Sallis on 9 Jul 1857 in Brighton, Tasmania. William was born about 1821 in Horeling, Oxford and died on 28 Sep 1883 in Brighton, Tasmania aged about 62.